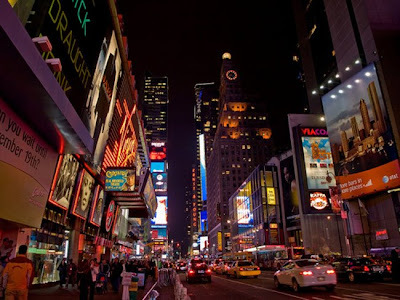 I spent a wonderful seven days in New York enjoying the city, shopping, and eating. My three favorite things. It was great being back in the big apple after a couple years of being on the West coast, sans a New York trip. I frequented Paris more these past couple years for some reason. I suppose I had my fix of NYC after being there for months in 2006. I realized it is a cold, lonesome place, and the people did not make it any better. That does not change the fact that it is pretty much the capital of the world. The center of culture; fashion, the arts, industry, banking, the list goes on. So I got my fix and am relieved to be back in the clean, green, pacific northwest. No, I don't mean environmentally friendly, I love the evergreens, that's all. * Bedazzle your wardrobe (in moderation). I got this jeweled cuff. The stones shine in colors rose, gold and dusty blue. Paired with a deep blue fitted dress I got, it draws the eye straight to the shine. * High waist loose shorts. I bought a black pair for the spring. Paired with a flirtatious top, they are so effortlessly gorgeous, and 1940's. 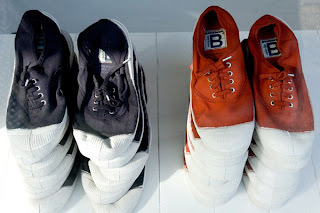 * Bensimon tennies! I used to wear them when I was younger, but was unable to find them when I moved to the U.S. Basically they are small (not bulky), European tennis shoes that can be worn with shorts, skirts, and skinnie jeans. They are feminine and comfortable. But most importantly they can be thrown in a suitcase and pretty much take up no space. All the things I love. * Galo ballet flats. Hand made Italian all leather traditionally shaped ballerina flats. Must I say anything more? I thought not. Love is all I feel when I look at them. I got two pairs, black and gun metal. The two most useful colors for shoes. * Burgundy croc doctor bag. There was a 70% off clearance sale, what can I say? So those are my most recent obsessions. I'm glad to be back in Seattle with my new fashion items, but I would love the weather to clear up so I can wear them.